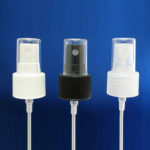 Need a fingertip sprayer pump with an even higher output than our Dewmist fine mist sprayer pump? You have the option of our standard regular mist sprayer pumps with a 1.0cc output. These fine mist spray pumps feature a more controlled spray pattern for better application of your product. They are faster priming so they pump sooner in less strokes. They also have a lower force to actuate meaning they are easier on the fingers of your customers to actuate than any other fingertip fine mist sprayer pumps. This makes them much more comfortable for your customer, especially seniors, to use than other fine mist sprayer pumps. Some of the many uses for these high quality sprayer pumps are for hair care products, room fresheners, perfumes, suntan products, insect repellant’s, bath & body sprays, eyeglass cleaners, breath & vitamin sprays, cleaning products and hundreds of other uses. One of our optional features allows the consumer to spray your product with an even controlled mist and hold the bottle in any position â even upside down! This feature is excellent for products such as foot and body sprays, spray sun tan products, feminine products, hair care products, and cleaning products for hard to reach areas. There is also a High Viscosity version, which is designed as the name implies, to spray products that have a higher viscosity such as gels, spray butter, some oil products, etc, that would work better than other fingertip sprayer pumps. Custom colors or custom collars, and various outputs and a nozzle extension, are available as a custom order. For real heavy-duty jobs our trigger sprayer pumps should fit the bill. Comfortable in the hand, yet built to last, our standard trigger sprayers allow you to adjust the spray pattern from a misting spray to a forceful stream. A foaming option is also available. Think of Drug and Cosmetic Packaging first for all of your dispensing and packaging needs. Dip Tubes can be made to any length.